Epidiah Ravachol posted about the Bullwinkle and Rocky RPG the other day (note: in 2014, when I first posted this on Google+), making the point (assuming I’m smart enough to have understood him correctly) that you can design the most cutting-edge game in the world but if you produce it in a context no one cares about, no one will care. 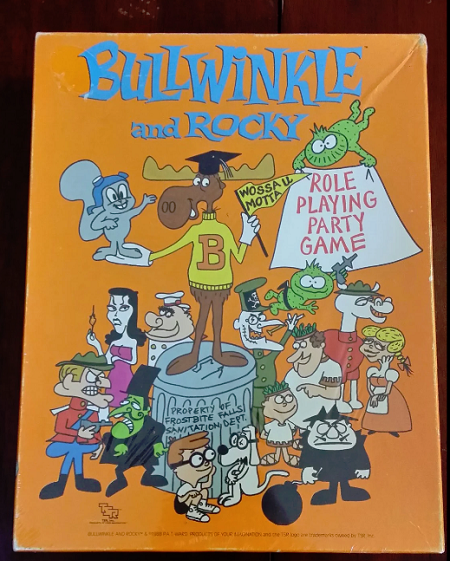 Bullwinkle and Rocky, published by TSR in 1988, is nuts. It looks like a story game before there were story games, and it’s packed with interesting stuff: spinners instead of dice, hand puppets, three versions of the game, cards as story prompts, and more. It’s pretty amazing how different this game is from most RPGs produced in 1988. I never got into Bullwinkle. I didn’t watch it as a kid and it holds next to zero interest for me now. But this game is totally nifty. And because, circling back, I’d guess it went over like a lead balloon, you can still find a copy in shrink for not much money despite it being 26 years old.